Upscaling DVD with online features to rival BD? 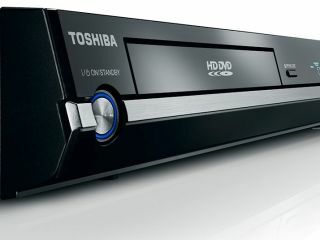 We all know that its loss to Blu-ray in the HD format war has left Toshiba pootling around with old-school DVD technology, but a surprise disclosure reveals that it may yet have something special up its sleeve. At the most recent meeting of the DVD Forum steering committee, in L.A. last month, the Toshiba-led group approved a logo for a new flavour of DVD to be known as 'DVD Download DL'. It doesn't take a genius to work out that this suggests someone is looking to add online features to DVDs in much the same way as on BD Live disks. Clearly, any such changes will require new players, something Toshiba has already said it is planning to provide. When we asked Toshiba Japan to clarify this latest development, they told us, "We have not announced anything about the DVD product and we cannot talk about products based on … assumptions." If the already-promised DVD upscaling to HD quality combines effectively with the new online feature and a price considerably lower than BD players, there may still be life in the old dog.